We have had some great movies-about-movies recently. Adding to that list is Argo, the film about 6 American diplomats who are taken as part of the 1979 Iranian Hostage Crisis. 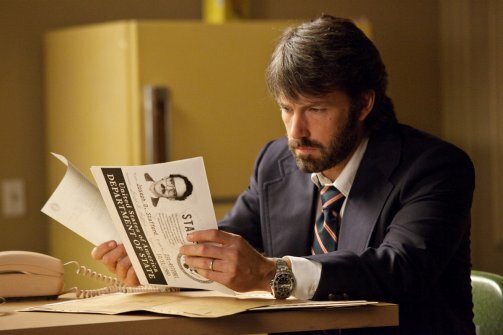 In arranging for their escape, CIA specialist Tony Mendez (Ben Affleck) comes up with the idea of creating covers for the individuals by claiming that they are part of a film crew sent to Iran to look at shooting locations. As a political thriller, Argo is just about as good as they come. There is some great screenwriting going on that mixes the drama and action in such a way that we never get bored. I thought the cast was great; John Goodman and Alan Arkin give just the right amount of comic relief. Ben Affleck is no rookie when it comes to great acting, and he really knows when to amp up the suspense with his performance and direction. The third act of the film is really what won me over. Though some of the events depicted are obviously dramatized, I couldn’t help but thinking “Wow – this really happened” over and over during the film’s final 20 minutes. Overall, Argo is a very good film and proves that you can have a blockbuster thats smart as well as entertaining. I’ll definitely be keeping my eye on this one for some Oscar recognition.